September 16, 2017 was the centenary of the birth of Prescot journalist Bert Taylor, who wrote a sports column for the Prescot Reporter from the late 1930s to his retirement in the 1980s. The sports included everything from darts and snooker to pigeon racing, cycling and cricket, but above all Bert wrote about football  and his beloved home team Prescot Cables. Published every Friday, the column was usually headlined Bons Sports Gossip, Bon being an acronym for Berts Own Notes. During the football season, each column featured Cables match reports from the previous week, previews of upcoming fixtures and news about the club, its players and the game in general. This work was combined with duties in BICCs Publicity Department, where Bert later became Editor of the companys inhouse magazine The Link. 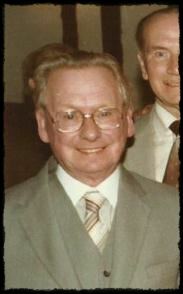 Bert Fazakerley Taylor was born in Prescot on 16 September 1917, the seventh child of Henry and Ellen Taylor. Henry was licensee of the Royal Hotel, High Street, Prescot. Berts siblings included a second Henry Taylor (1903-70), who climbed from Office Boy to Company Chairman of shipping firm Coker Line. He served as an Independent Conservative on Prescot Urban District Council (Chairman 1936 and 1953) and ended up as JP and MBE. Like his brother Henry, Bert attended Prescot Grammar School, at the end of which he worked for a time in the iron foundry at British Insulated Cables (later BICC). By the outbreak of war Bert, still in his early 20s, was already writing his Bon sports column. The war years were spent in the Army, after which he returned both to the factory (but now safely behind a desk) and his column in the Reporter. His match reports, written when sports photographs were rare and words ruled supreme, were precise, measured, detailed and studiously unbiased. By the time he retired, he had been appointed Prescot Cables President  a fitting reward for such a loyal servant. One of his first tasks was to organize a Players Dinner to mark Cables centenary in 1984. It was a glittering evening attended by Prescots football elite  the likes of Roscoe, Lyon, Jelly and Grisedale. Sadly, Bert passed away two days after his 85th birthday in September 2002, the victim of a tragic domestic accident. His legacy is a huge collection of press clippings kept at Prescot Museum. Are you the athletic type yourself? the Reporter Editor had asked him at his interview back in the 1930s. No, sir, Bert replied. Then you will have a long and injury-free career on the Prescot Reporter. And so he did.